Double Glazed Doors – What are the different design options? They are always the front line in terms of home security and can give a great, or poor, impression to visitors and passers-by alike. But what are the different design options for modern double glazed doors and which are the best doors to use for each location in your home? The most popular styles of exterior doors in the market. How much does the average double glazed door cost? No surprises here, it’s quite obvious that there are only 3 possible places to locate your external doors, the back, the front or the side. However, you do have a very wide choice in terms of the functionality and appearance of your doors. This is especially true at the rear of the property where many homeowners have either swapped the back door for a patio door, or even in some cases, have both. Most front & back doors are single “swing doors” that open inwards. They can be full length glazed, part glazed or without any glazing elements. A standard sized front or back door in the UK can be found in the following sizes. Wider or higher entrances than those shown above (many Victorian era homes have high front entrances) can utilise side panels or top panels to take up the extra space. If there is enough width, a set of double doors can be used. Two very appealing entrance door designs are the Cottage and Stable style. Although they have a more “country-fied or rustic” look, they include all the features you would expect from a modern double glazed door and can be used at the front or the rear of the property. Stable doors are particularly unique in both appearance and function. The door itself is comprised of 2 sections, a top & bottom half. The top half of the door can open independently of the bottom half, creating, what is effectively, a window. The sections can also be locked together and operate as a regular door. Of course if you want really stand out from the crowd, then there are many bespoke door designs from which to choose. At the top end of the range, some of the latest Aluminium or Hardwood doors are truly amazing, but pricey. Expect to go well over £1,500 for a bespoke front door. As a firm favourite in the UK, you can see patio doors used in almost every type of house, from the modest to the grand. Not often used at the front of a property, unless for a porch of some kind, French doors are widely used at the rear of a home as patio doors. They suit the purpose very well with the twin side-by-side door configuration that leaves a nice clear exit or entry once opened fully. In bad weather, or if you just want to pop in and out, only one door need be opened to do so. You can select left or right to be the master door. 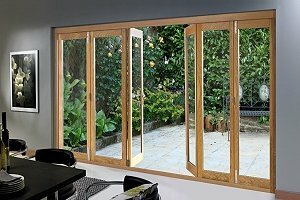 A lot of people choose to have French patio doors opening outwards, but inward opening is an option. You will have to keep space clear to account for the doors when they open, and if the doors are wet from recent rain, they could end up draining water all over your floor – just bear that in mind. The only drawback about French patio doors is that, for wider entrances, you will need side panels. The practical usable width limit for a single set of French doors would be around 2000mm without side panels. I’ll take a risk and say that if you ask someone to describe a patio door, this is the design they will describe. Although French doors have been around for 100’s of years, the sliding patio door remains one of the more popular installations all over the world. The doors, as you can guess from the name, slide from side to side and do so within the outer frame. There is no practical limit on how wide an opening you can fit with sliding patio doors, just keep adding another panel. 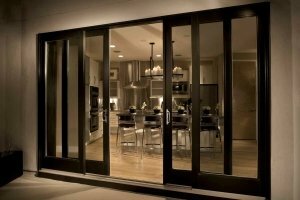 The drawback for sliding patio doors is with smaller openings. In situations such as 2 or 3 door installations, the doors will get in the way and reduce the entryway somewhat, because they sit within the frame. For a 2 door installation that means you lose around half of the entryway clearance because the doors are there. As the more recent design of patio door, Bifolds are fast gaining a major foothold in the home improvement market. The design is such that the door leaves fold to the sides, much like a concertina, and stack there completely out of the way. What this creates is a massive, almost 100% clear entryway, no matter what size of door you fit. It must be said that bifold patio doors create a spectacular view of the outside once opened, virtually making your home and your garden into a single space. They also work well in smaller spaces. In many cases such as this, bifold doors are a lot more practical than sliding doors because they don’t take up space like sliding doors do (once opened). The type of material you choose for your double glazed door is going to have not only an effect on the look, but also the cost. To give you some idea of which material could best suit your circumstances, here is a short Pro’s & Con’s together with a general “rough guide” to average prices. Softwood exterior doors are usually the lowest cost option, but can take a lot of looking after in order to make them last a long time. Prone to swelling, shrinking or warping. Hardwood doors are a better option. Although costlier than softwood, it is more stable less prone to distortion and if you look after them, they can last 30, 40, 50 years or more. How much do hardwood doors cost? Hardwood Front doors prices from £250 to £350 + fitting. Oak French doors prices from £500 to £1,000 + fitting. Hardwood Veneer Bifold doors prices from £1,400 to £1,600 (1800 x 2100mm 2 panel). Oak Veneer Sliding Patio doors prices from £500 to £650 + fitting. The latest double glazed aluminium doors are sleek, strong and really do look good. Issues with heat transfer are no longer an issue (metal conducts heat very easily) by means of using thermal breaks within the frames. There is a huge colour range with 100’s of RAL powder coat paint finishes, as well as wood-grain effect. The inherent structural strength of aluminium means that in many cases the frames can be made much thinner than those for timber or UPVC, giving a lovely slimline visual appearance. Aluminium front doors prices from £1,100 to £2,000 (aluminium clad engineered wood). Aluminium French doors prices from £900 to £1,000 + fitting. Aluminium Bifold doors prices from £1,500 to £2,000 + fitting (3 panel). Aluminium sliding patio doors prices from £1200 to £1,500 + fitting. Composite frames & doors are made from a combination of Glass reinforced polymers (GRP), timber and UPVC. They are exceptionally strong, hard wearing and very secure. They also have high levels of energy efficiency. Available in wide range of colours, you can expect them to last 30 years or more if you look after them (which is not difficult or very time consuming). Composite front doors prices from £800 to £1,100. UPVC is such a great material to use for external doors. It’s very light & strong, does not corrode, rot or degrade like aluminium or timber. It is also very stable in terms of expansion and contraction (your doors always fit properly). The choice of colour is expansive with around 20 options, plus twin colour options as well wood-grain surface finishes if you prefer. 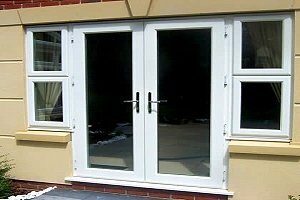 Whilst not having the same lifespan as a well looked after hardwood door, you can expect to have around 20 years or so from a good quality UPVC double glazed door. UPVC front doors prices from £450 supply only & £600 to £650 fitted. As a high traffic area, you should make sure that you have toughened safety glass fitted (it’s also a UK building regulation requirement in certain areas. In terms of overall appearance most, if not all, types of double glazed doors (whatever they are made from) will have a wide range of looks and finishes from which to choose. You will also find, that when it comes to energy efficiency, security or even lifespan, there is little to separate UPVC, Aluminium or Composite doors from each other. However, when it comes to cost, there can be quite a difference. 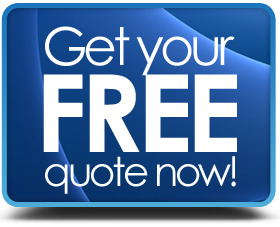 Our suggestion, along with most consumer groups, is to get a selection of written quotations from a number of different installers and compare the costs & features on offer. With access to installers based all over the UK we can help you find the best deals on offer. Just drop us a few details about your project, let us know how to contact you and we will do the rest.